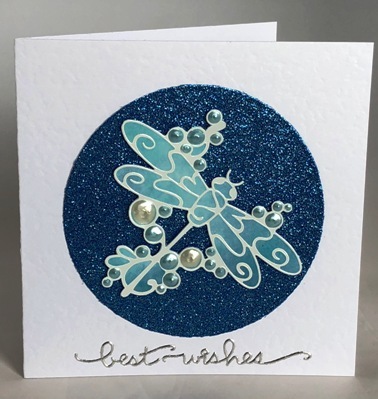 This handmade greetings card shows a dragonfly hovering above a circle I have cut from royal blue glitter paper. I have set the white dragonfly on turquoise watercolour paper and embellished it with pale blue and cream pearlescent drops. The words Best Wishes are written in silver lettering at the foot of the card. The glitter will not shed everywhere. The card is blank inside for your own greetings. If ordering by phone, please reference card #781.